Renault India launched the all-new Koleos. Superstar Salman Khan becomes the first owner of the all-new Koleos. system the car delivers superior power and outstanding torque. Also included in the new range are 4x2 and 4x4 manual transmission options. The superior power combined with excellent fuel efficiency, all new styling and outstanding luxury and safety features of the new Koleos make it a completely desirable package in the premium SUV space. 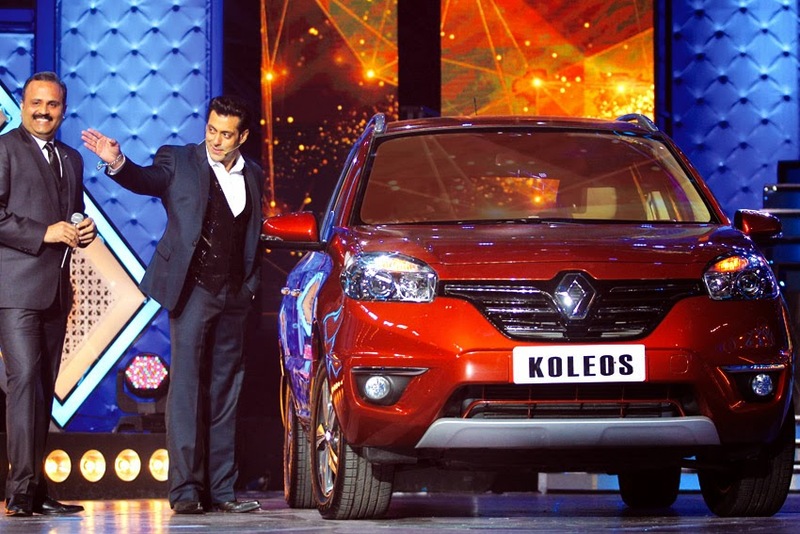 "I am glad that Mr. Salman Khan is the first owner of the all-new Koleos. The New Koleos dawns all the attributes of Mr. Salman Khan as the vehicle is adventurous and sophisticated, guaranteed to turn heads with its presence and performance," said Sumit Sawhney, Country CEO and Managing Director, Renault in India. A host of new technology and comfort-enhancing features are now offered for a safer and more pleasurable drive - Hill Start Assistance as well as Hill Descent Controls, six airbags and ESP make the new Koleos the safest vehicle in its class with a Euro NCAP 5-Star Rating, add to it the dual zone automatic air-conditioning with rear vents, state-of-the-art Bose Energy Efficient Series sound system, powered driver & passenger seats, ingenious & modular storage options, split tail gate, Rain sensing wipers and Dusk sensing head lamps. The all new Koleos is simply a unique proposition that offers an unmatched experience that is sophisticated for any adventure off road or on the road. The imposing new chrome front grille stylish chrome side protectors, silver satin roof rails, LED equipped indicators on door mirrors and new 17-inch two tone alloy wheels in the New Renault Koleos are designed to offer a distinctively elegant package. The new Koleos offers a class leading fuel efficiency of 17.15 kmpl in 4x2 manual option, 16.26 kmpl in 4x4 manual option and 14.56 kmpl in 4x4 automatic transmission guise. The new Renault Koleos is now available at Renault dealerships across the country at Delhi ex-showroom prices of Rs. 22,32,999 (4x2 manual), Rs. 25,13,999 (4x4 manual) and Rs. 26,18,999 (4x4 automatic transmission).